Ok, I did actually really, enormously enjoyed this book, so I definitely need more than just three quick points to express my love. But hey, at least you already have an idea, right? First of all, as I said, Tell Me Three Things is super cute and adorable and will make you laugh and swoon quite regularly. BUT. That’s not all. It actually deals with quite a few harder topics, such as grief, change, addiction and peer pressure. And I loved the way all of these things were balanced so nicely and how in the end, it was still so easy to read. The characters in this are actually all well-developed and multidimensional characters (other than a few exceptions). I loved following Jessie because she felt so real, relatable and just like an actual 16-year old girl. She was fun and brave and self-confident in her own way. Not to mention, she’s an actual bookworm, so hey, kudos for that! I also loved getting to know all the secondary characters like SN, Scarlet, Dri, Agnes, Theo, Ethan, Liam and even Caleb. Though they may have all started off as feeling a bit stereotypical, they all quickly broke their molds and became their own characters. Other than the typical mean-girl stereotype, most characters were multidimensional and real. – Friendships! There’s a lot of focus on friendships and it didn’t shy away from the good and the bad and I loved how realistic it all felt. – Bookworms! There are lots of bookish references and a cool bookstore where I wouldn’t mind working myself. – Music love! I wish Oville was real band because I want to hear their songs myself. – Theo! Jessie’s stepbrother went from being a jerk to one of my favorite characters. – It felt too short. I could have used more. A little epilogue wouldn’t have hurt for example. Also, just needed more Jessie/SN conversations. – Could have used just a little more parents. Jessie’s dad had a few big scenes, but the stepmother felt sorely underused. – The depiction of LA/California felt really stereotypical. I don’t live there myself, but really? Is it that shallow? Overall, I highly enjoyed this and would recommend to anyone looking to read an adorable and fun YA contemporary. If you’re like me and have any love for penpal romance tropes, then I think this will definitely satisfy your craving. 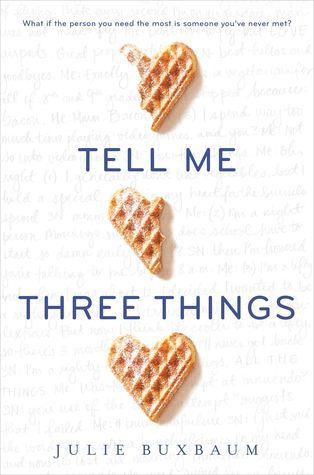 Have you read Tell Me Three Things? What did you think about it? Now I am craving chocolate! Great review Lindsey, glad to know you enjoyed it! Surprisingly I have never heard of this book? But the premise is really cool! Prabhleen recently posted…NO JUDGING- READ WHAT YOU LIKE AND WHAT YOU WANT TO!! i’m going to read this soon and i’m so excited because i’ve been looking for a cute contemp and this one seems to have good reviews so i can’t wait to dig in!! Oh, if you’re looking for a cute contemporary, I definitely recommend this one 🙂 Hope you’ll enjoy! Glad you enjoyed this!! I thought it was adorable too. I agree I am all about the pen pal trope. So good!! Great review! I really need to read this. I’ve seen quite a few people speak well of it. I have to admit that I’ve spent many months staring at this cute cover (because WAFFLES!) but never actually reading the blurb. I’m so glad I read your review though because now I’m interested in so much more than the cover. It sounds like a super cute read.